Rearrangements of the anaplastic lymphoma kinase (ALK) belong to the promising targets in the therapy of advanced non-small cell lung cancer (NSCLC) and are predominantly detected by immunohistochemistry (IHC) and/or fluorescence in-situ hybridization (FISH). However, both methods occasionally produce discordant results, especially in so-called borderline (BL) cases, showing ALK FISH-positive signals in 10–20% of the tumor nuclei around the cutoff (15%). This leads to a diagnostic and thus to a therapeutic dilemma. We selected 18 unequivocal (12 ALK IHC/FISH-negative; 6 ALK IHC/FISH-positive) and 15 equivocal samples with discordant results between FISH (Abbott, Vysis LSI ALK Dual Color) and IHC (Ventana, D5F3), including cases with FISH-BL results, for further RNA based-analysis. To detect ALK rearrangement at the transcriptional level, RNA was analyzed using a targeted multiplex-PCR panel followed by IonTorrent sequencing and by direct transcript counting using a digital probe-based assay (NanoString). Sensitivity of both methods was defined using RNA obtained from an ALK-positive cell line dilution series. Cases with unequivocal IHC/FISH results showed concordant data with both RNA-based methods, whereas the three IHC-negative/FISH-positive samples were negative. The four IHC-negative/FISH-BL-negative cases, as well as the five IHC-negative/FISH-BL-positive samples showed negative results by massive parallel sequencing (MPS) and digital probe-based assay. The two IHC-positive/FISH-BL-positive cases were both positive on the RNA-level, whereas a tumor with questionable IHC and FISH-BL-positive status displayed no ALK fusion transcript. 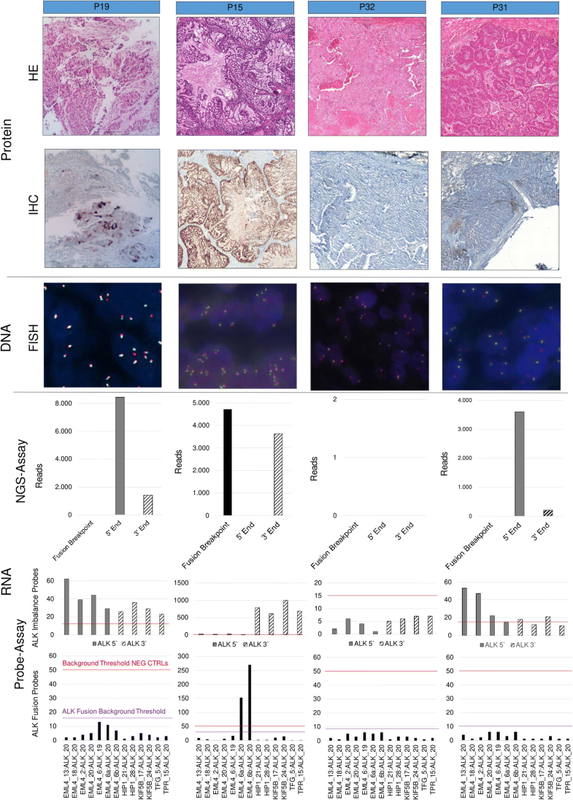 The comparison of methods for the confirmation of ALK rearrangements revealed that the detection of ALK protein by IHC and ALK fusion transcripts on transcriptional level by MPS and the probe-based assay leads to concordant results. Only a small proportion of clearly ALK FISH-positive cases are unable to express the ALK protein and ALK fusion transcript which might explain a non-responding to ALK inhibitors. Therefore, our findings led us to conclude that ALK testing should initially be based on IHC and/or RNA-based methods. Alterations (paracentric inversion/translocation) of the anaplastic lymphoma kinase (ALK) gene occur in about 3–4% of non-small cell lung cancers (NSCLC) and represent a drugable target [1, 2]. Since the approval of the first ALK tyrosine kinase inhibitor (TKI) in the US (2011) and in Europe (2012), as well as of further second and third line TKI, ALK testing in locally advanced or metastatic non-pure squamous NSCLC is currently the diagnostic standard [3–5]. Fluorescence in-situ hybridization (FISH) was used as the diagnostic method of choice in the studies leading to the approval of Crizotinib [6, 7]. The Food and Drug Administration (FDA) reflected this aspect within the authorization text [8, 9] therefore FISH is still regarded as the gold standard for the detection of ALK rearrangements. However, meanwhile the FDA further approved the Ventana ALK (D5F3) CDx immunohistochemistry (IHC) assay as a companion diagnostics to identify patients eligible for ALK TKI treatment [10, 11]. Thus, two different diagnostic approaches (DNA and protein-based) might be used, if carefully validated , for patient care. This is in line with the European Medicines Agency (EMA) authorization text that “only” requires the proof of an “advanced ALK positive NSCLC” . However, even though validated and recommended [3, 13–18], IHC and FISH might still produce discordant results [18–23] leading to a diagnostic and therapeutic dilemma. As RNA-based assays were reported as promising tools for ALK testing in some case series [24–27], we performed massive parallel sequencing (MPS) using IonTorrent chemistry and a probe-based technology (NanoString) allowing a direct counting of RNA molecules in an IHC and FISH pretested NSCLC cohort [13, 21]. In this study (ML39478) we refer to already ALK tested (IHC and FISH) NSCLC samples being part of recent publications [13, 21] as well as of our daily routine setting. Therefore, the number of samples included in this study was related to the availability of ALK positive samples. The methods of ALK IHC (VENTANA ALK (D5F3) CDx Assay, Ventana Medical Systems, Tucson, AZ, USA) and ALK FISH (Vysis LSI ALK Dual Color, Abbott Molecular, Abbott Park, IL, USA) were described elsewhere in detail [13, 21, 28–30]. Besides clear cut ALK negative and positive samples by IHC and FISH, a special focus was set on ALK FISH-borderline (BL) samples with split signal (SS)/single red signal (SRS) between 10 and 20%, which were further sub-classified in FISH-BL-negative (10–14% SS/SRS) and FISH-BL-positive (15–20%) . Furthermore, three IHC-negative/FISH-positive tumors (one case with SS/SRS in 30% of the tumor cell nuclei and two cases with > 60% SRS), as well as one with an unclear ALK IHC staining pattern were selected. In total, representative tumor areas of the 33 formalin-fixed and paraffin embedded (FFPE) NSCLC samples (18 operative and 15 biopsy specimen; 32 adenocarcinoma, 1 adeno-squamous carcinoma) were chosen for further RNA-based testing. The different diagnostic ALK-groups were as follows: 12x IHC-negative/FISH-negative, 4x IHC-negative/FISH-BL-negative, 5x IHC-negative/FISH-BL-positive, 3x IHC-negative/FISH-positive, 2x IHC-positive/FISH-BL-positive, 6x IHC-positive/FISH-positive and 1x IHC-unclear/FISH-BL-positive (Table 1). For ALK fusion detection at the RNA level all 33 samples were subjected to PCR-based MPS. 23 samples were further examined using NanoString allowing a direct count of RNA transcripts. Three to ten 10 μm thick sections of FFPE tissue were macrodissected and subjected to RNA isolation using the Maxwell16 LEV RNA FFPE Kit (Promega, Fitchburg, WI, USA) according to manufacturers’ protocol modified as follows: samples were incubated with 25 μl proteinase K (20 mg/ml, Promega) and 250 μl lysis buffer (Promega) for 30 min at 56 °C, followed by 25 min of inactivation at 80 °C. No mineral oil was used for RNA extraction procedure. The RNA concentration was determined using Qubit 2.0 fluorometer (Thermo Fisher Scientific, Waltham, MA, USA) and RNA quality was assessed using the Fragment Analyzer (Advanced Analytical Technologies, Ankeny, IA, USA) microfluidic system. To determine the limit of detection (LoD) of MPS and the probe-based assay, we serially diluted RNA from the cancer cell line H2228 positive for ALK fusion (EML4-ALK v3a/b) with decreasing amounts of wild-type RNA from palatine tonsil tissue (100, 50, 30, 10, 5, 1 and 0%). In order to selectively amplify ALK fusion transcripts, the Ion AmpliSeq RNA Fusion Lung Cancer Research Panel (Thermo Fisher Scientific) was used. Sample enrichment and library preparation followed the instructions of the Ion AmpliSeq DNA and RNA Library Preparation manual (MAN0006735, Revision B.0; Thermo Fisher Scientific). Briefly, a total of 10 ng RNA was reverse transcribed and subjected to target enrichment by multiplex-PCR amplification with Ion AmpliSeq Library Kit 2.0 (Thermo Fisher Scientific). Finally, libraries were quantified by quantitative real-time PCR (Ion Library TaqMan Quantitation Kit, Thermo Fisher Scientific) and pooled in an equimolar ratio. For sequencing, libraries were pooled and templated using the Ion Chef instrument according to the Ion PGM Sequencing 200 Kit v2 user guide or Ion 520 & 530 Kit – Chef user guide (Thermo Fisher Scientific). Subsequently, sequencing of the Ion 318 chip was carried out on the Personal Genome Machine (PGM, Thermo Fisher Scientific) using the Ion Torrent 200 bp sequencing v2 chemistry. Sequencing of the Ion 530 chip was done on the Ion S5 XL system (Thermo Fisher Scientific) following manufacturers’ protocol. Raw sequencing data was processed using the Torrent Suite Software (version 5.0.2) and aligned against the human genome (version hg19). Detection of fusion transcripts was done using the AmpliSeq RNA Lung Fusion Single Sample High Sensitivity workflow (version 5.0) integrated in the Ion Reporter 5.0. Data analysis was further performed according to parameters defined by the OncoNetwork Consortium and as described in the guidelines to interpret 3′/5′ imbalance values in the Ion Reporter Software. nCounter Lung Gene Fusion Panel (NanoString Technologies, Seattle, WA, USA) was used for probe-based detection of fusion genes in the selected tumor samples. Hybridization and digital reporter counts were performed following the manufacturer’s instructions for nCounter Vantage Fusion Assays (MAN-10023-09, nCounter XT Assay User Manual). Briefly, 84 ng–300 ng of total FFPE RNA was hybridized to nCounter probe sets for 16 h at 67 °C. Samples were processed using automated nCounter Sample Prep Station (NanoString Technologies). Cartridges were subsequently imaged on an nCounter Digital Analyzer (NanoString Technologies) set at 555 fields of view (FoV). Reporter counts were collected using NanoString’s NSolver software version 3.0 and analyzed with fusion threshold set at 50 and imbalance threshold at 15 depending on the background level of absolute raw data count. MPS fusion breakpoint detection showed a LoD at 10% fusion positive cell line dilution, whereas EML4-ALK fusion detection by 3′/5′ imbalance was uncertain or negative for all H2228 dilutions (Table 2). The MPS assay showed 100% specificity for ALK fusion detection and a higher sensitivity for breakpoint than for 3′/5′ analysis (67% vs. 33%) with uncertain data stated as negative. Imbalance and fusion breakpoint results were concordant in 29/32 analyzable cases (90%). Variations were detected for imbalance results in which 4/32 cases were uncertain, two were fusion breakpoint negative after repetition and one remained uncertain. Imbalance result for 1/32 sample, detected as fusion breakpoint positive was negative after repetition. ALK fusion was detected by 3′/5′ imbalance probes down to 5% cell line dilution whereas LoD for fusion detection by breakpoint probe was 30% (Table 2). The probe-based assay showed 100% specificity for ALK fusion detection and a higher sensitivity for 3′/5′ analysis than for breakpoint detection (83% vs. 50%). Imbalance and fusion breakpoint results of clinical samples were concordant in all 23 cases (100%). Eighteen unequivocal and 15 equivocal samples were investigated by MPS and/or a digital probe-based method. Four out of 12 ALK IHC-negative/FISH-negative and all 6 IHC-positive/FISH-positive cases showed concordance with both RNA-based methods regarding fusion breakpoint detection, one case was not analyzable (Table 3). The three IHC-negative/FISH-positive samples were negative with the two RNA-based methods for both, breakpoint and imbalance detection (Table 4). The four IHC-negative/FISH-BL-negative cases, as well as the five IHC-negative/FISH-BL-positive samples showed negative results by MPS and digital probe-based assay. The two IHC-positive/FISH-BL-positive samples were consistently positive at the RNA level, whereas the case showing questionable IHC and FISH-BL-positive status was negative (Fig. 1). Since the approval of Crizotinib, there had been much effort to improve, harmonize and even fasten the diagnostic process of ALK testing [13–16, 31–33]. In this context, several ring trials and multi-center studies have confirmed the diagnostic reliability and quality of IHC and FISH [13–16, 31–34]. Concerning in-situ hybridization it was further shown that CISH (chromogenic based) can be regarded as an alternative reliable method [35, 36]. However, due to technical reasons, there might be samples that will be misclassified if FISH or CISH was used as stand-alone test [21, 37]. This is especially true for samples that show SS/SRS around the 15% cutoff . To this end, it was highly appreciated that several initiatives demonstrated ALK IHC as a dependable method, if carefully validated [10, 13, 15, 31–33, 38–40]. However, there are still several reports depicting discrepant results by IHC and FISH [18–26], leading to diagnostic problem and a potential “wrong” therapeutically decision. First of all, this is due to the so-called BL tumors especially those with SS/SRS FISH signals between 15 and 20% of the tumor cells. The fact that “true” ALK negative tumors and normal lung tissue may harbor SS in up to 11% of the tumor cells and ~ 8.5% of the NSCLC show SS between 10 and 15% is further complicating this situation [41–43]. To this end it was recommended, that in biopsy specimens (with a few tumor cells only), the unequivocal result of a validated IHC should be used for therapy planning in NSCLC cases even though if FISH was negative . Our data underline that a validated ALK IHC produces dependable results in most cases. We only found one sample in our cohort leading to an unclear staining pattern due to some, focal positive cells (questionable tumor cells or macrophages). The Ventana Interpretation Guide for the D5F3-Optiview system defines IHC-positivity if even single tumor cells show a cytoplasmic staining . However, in our experience ALK positive staining, if truly positive, will be found in all (almost all) tumor cells and not merely in a small subpopulation due to its role as driver mutation. This is further demonstrated by the homogenous staining for the ALK protein in all tumor cells of the IHC-positive/FISH-BL-positive cases and further underlines that the occurrence of discrepant ALK results for IHC and FISH is due to technical reasons of FISH. This assumption was confirmed by some studies, which were able to reproduce the IHC results on the RNA-level by means of RT-PCR or MPS [24–27, 44, 45]. This is also true for our study that confirmed the IHC results by MPS and the probe-based NanoString assay and therefore strengthens the hypothesis that IHC and RNA-based methods reflect the true biological situation. Unfortunately, clinical data within our cohort were scarce for the most of the cases. However, at present four patients of our study with an ALK IHC-negative/FISH-BL status were treated with an ALK TKI at Charité University Hospital and all did not show any benefit based on this therapy. Interestingly, we further characterized three other discrepant samples, which were ALK IHC-negative/FISH-positive and also negative at the transcriptional level by MPS and NanoString. Concerning the ALK FISH pattern, two of them displayed SRS in > 60% of the tumor cells. A comparable observation, with SRS-samples displaying no protein expression and no transcript was made by Gao et al. . Therefore, it seems that IHC/FISH discrepancy might be caused in the context of a FISH BL-status, especially in the context of small biopsies , however, might be further seen in at first sight “true” FISH-positive cases with SRS-pattern. This situation is still insufficiently covered by clinical data but it is justified to conclude that no transcription or translation of the ALK fusion gene occurs [45, 46]. A possible explanation for this observation, the break might have occurred but the promoter might not have been translocated to the ALK gene or might even have been lost, thus preventing ALK expression despite the genomic ALK alteration (non-productive rearrangement). This might be one explanation for the documented non-responders in the FISH-based trials leading to the TKI approval (see waterfall blot in ref. [6, 7]) already discussed in the literature . To conclude, as predictive testing in NSCLC becomes more and more complex and further treatable targets (besides EGFR, ALK, ROS1, MET, RET, BRAF, HER2, PD-L1) will arise in the nearer future , pragmatic approaches (reliable, not time and money consuming, multiplexable) are needed. Furthermore, current hybrid capture-based sequencing assays allow the additional detection of so far unknown fusion partners [48–50]. As this might not always be applicable for routine analysis, this was beyond the scope of our investigations. However, these approaches will enable a further comprehensive fusion analysis, helping for a better understanding of the molecular mechanism in lung cancer [48–51]. The results of this study show that ALK testing should be based on methods that reflect the functional level of ALK. As RNA-based methods confirmed the IHC-status, future diagnostic algorithms should be based on these approaches, whereas FISH, at least as a stand-alone test, seems not eligible anymore. The comparison of different methods for the confirmation of ALK rearrangements revealed that the detection of the protein (IHC) and the fusion transcripts on transcriptional level (sequencing and probe-based assays) leads to concordant results. A small proportion of clearly ALK FISH-positive cases do not express the ALK protein and the fusion transcript, which might explain non-response to ALK inhibitors (non-productive rearrangement). Therefore, our findings led us to conclude that ALK testing should initially be based on IHC- and/or RNA-based methods. This might further avoid needless ALK-TKI therapies in ALK FISH-BL cases. We thank the molecular pathology team at our institution, especially Hedwig Lammert, Janine Roesener and Carola Priebe for the technical expertise. Doctor M. v. Laffert is participant in the Berlin Institute of Health (BIH) Charité Clinician Scientist Program funded by the Charité – Universitätsmedizin Berlin and the Berlin Institute of Health. Part of the study was sponsored by Roche Pharma AG, Germany (ALK-IHC-FISH-NGS Head to Head Study ML39478). The datasets of presented data are available from the corresponding authors on reasonable request. CV, DL, MH, AL, MM, NF, ML, NF and MD made substantial contributions to study conception and design. LS, PJ and UK participated in acquisition of data and characterization of samples. CV, ML, LS, PJ and UK collected and analyzed the data. ML, CV, MH and DL drafted the manuscript. AL, NF, PJ, LS, UK and MD carefully revised the manuscript critically. All authors (CV, DL, MH, AL, MM, NF, PJ, LS, UK, MD and ML) have read and approved the final manuscript. This research conformed to the provisions of the Declaration of Helsinki. The present study including participants was conducted according to institutional guideline, and was approved by the Ethics Commission of the Charité-Universitätsmedizin (approval No EA1/226/16). https://www.cancer.gov/about-cancer/treatment/drugs/fda-crizotinib Accessed 19 Feb 2018.
https://www.accessdata.fda.gov/cdrh_docs/pdf14/p140025b.pdf Accessed 19 Feb 2018.
https://www.accessdata.fda.gov/cdrh_docs/pdf16/p160045d.pdf Accessed 19 Feb 2018.
http://www.ema.europa.eu/docs/en_GB/document_library/EPAR_-_Public_assessment_report/human/002489/WC500134761.pdf Accessed 19 Feb 2018.
http://www.roche-diagnostics.ch/content/dam/corporate/roche-dia_ch/documents/broschueren/tissue_diagnostics/Parameter/lung-pathology/ALK_D5F3_interpretation%20Guide_EN.pdf Accessed 20 Aug 2017.
https://www.molecular.abbott/sal/en-us/staticAssets/Vysis_ALK_Evaluation_Guide_Final.pdf Accessed 20 Aug 2017.